This salad is beyond yummy! The candied almonds and dressing make it! This recipe comes from Simple Strawberry Sensations, a cookbook authored by former Tampa area meteorologist Laura York. (I should really include the cookbook in My Favorite Things because it is one of my favorite things! Look for that post soon!) York’s recipe did not include the chicken but its addition makes the salad an entrée rather than a side. I had my girlfriend over for lunch one day and really wanted to make it so I put boneless skinless chicken breasts in the basket appliance of my Showtime rotisserie then sliced it and put it on top of the delicious salad. A brilliant idea, if I do say so myself! My friend asked for the recipe and has served it too! The best compliment a cook could ever get! In addition to adding the chicken I also added cucumber to make it my own. A few notes to make this salad extra special: Chill the salad plates and forks. I sometimes use butter lettuce in addition to or in place of the Romaine. It’s my personal favorite lettuce. Serve with a corn muffin or slice of banana bread. Double the candied almonds…they make the salad! In a small skillet, cook almonds and sugar over low heat, stirring constantly until sugar is melted and almonds are coated. Sprinkle almonds onto a sheet of waxed paper; let cool. Break almonds apart and set aside. In a large salad bowl, toss the above ingredients together until combined. In a small container with a tight lid, combine the ingredients and shake to combine. Pour the dressing over the salad and toss to combine. 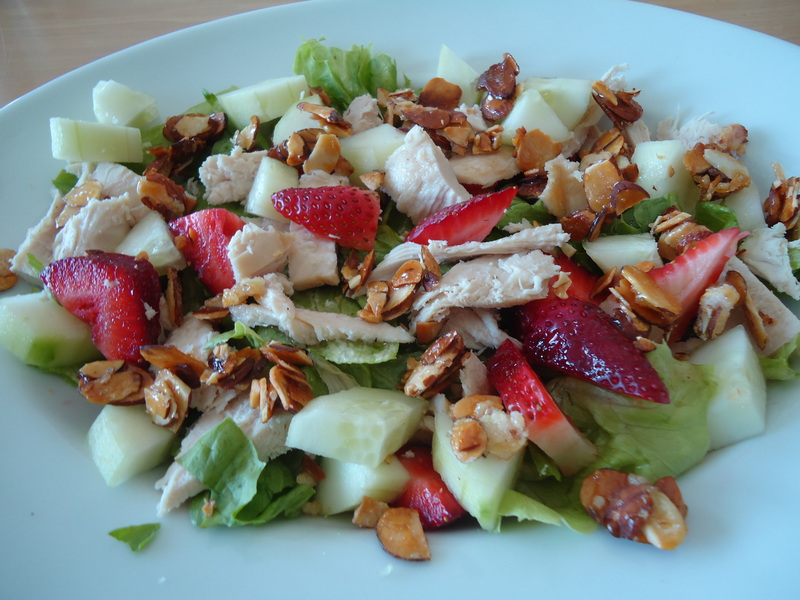 Divide among 2 plates and sprinkle candied almonds over salads. This entry was posted in Company Worthy, Salads and tagged candied nuts, strawberry, strawberry salad. Bookmark the permalink.